Secured credit cards are by far the best way to build credit. If you are facing difficulty for availing an unsecured credit card, then a secured credit card is the option you should go for. These cards also come in varieties based on the types of benefits they offer and the fees and charges that they entail. So, if you are looking for a secured credit card, you must pay attention to all these details and choose the card that works the best for you. Here we have listed the best-secured credit cards you can get your hands on in 2019. Key Feature- Access to the increased credit limit on making five timely payments. This secured credit card by Capital One works out the best for those who have severe or limited credit. They can get access to $200 credit limit with a security deposit of $49, $99 or $200 depending on the basis of your creditworthiness. When you make the first five monthly payments on time, you can get a higher credit line without the need to provide an additional deposit for the same. Being a Mastercard, it is widely accepted and offers benefits like extended warranty, travel accident insurance and round the clock road assistance to name a few. This card has an APR of 24.99 % on cash advances, balance transfers and purchases. Though this is slightly on the higher side in comparison to other cards, the same is neutralized by removing the annual fee. Also, it has a grace period of 25 days, which is long enough in order to accumulate the amount of money required to repay the full balance every month. This helps a customer to stay away from interest charges. Another important feature of this censures card by Capital one is its CreditWise tool and online account management. This is a great instrument for individuals looking to improve their credit profile as they make provisions for free credit monitoring and credit simulation. Capital One reports the card payments to all major credit bureaus. By not having to pay any foreign transaction fee, you can save a lot if you happen to travel abroad. Having a zero balance transfer fee is another boon if you want to transfer your balance from another credit card with a higher APR. Last but by no means the least- this card has certain features that will help you to be in complete control of your payments. You can have real-time tracking of your spending, make automated payments, choose your monthly due date and set text/email reminders through the official Capital One app. It is the most rewarding secured credit cards. The security deposit may range from $200 to $2,500, and if you use the card responsibly, you may even qualify for a deposit refund after eight months. The card offers 1% cash back on all purchases and 2% on restaurant bills and gas stations. You also get free FICO Score per month with the card. It is excellent for those who would like to move on to an unsecured card soon after. The absence of an annual fee even after offering a reward program is an absolute bonus for the borrowers. Even if you miss out your payment, the late fee is waived off for the first time and there is also no penalty APR for late payment. The 24.99 % APR for the Discover It Secured Credit Card is slightly on the higher side but it should not bother you if you make full payment of your balance every month. For the initial 6 months, every balance transfer is charged at 10.99 %. The minimum deposit amount of $200 may be higher than some of its competitors but it should be alright for individuals trying to improve their credit. The line of credit is equal to the deposit amount. As the initial deposit amount is required to be drawn from the bank account of the borrower, anyone without a savings/checking account won’t qualify for this secured credit card. Another important offering from Discover is that it provides the customer with an automatic upgrade facility to upgrade his secured credit card to an unsecured one, after one year of timely payments. After the approval, the account gets switched over automatically along with all rewards intact. The free access to the official FICO score is also another important benefit for anyone looking to improve his credit score. As an additional bonus, Discover matches all cash back that is earned by first-time cardholders automatically at the completion of the 1st year. Discover reports the card payments to all major credit bureaus. You can establish your credit history with this card by making responsible use. The credit limit is equal to your deposit so if you deposit $200, the same will be your limit on the card. Your credit activity is shared with all three major bureaus keeping your scores on an improving track when you make timely payments. Additional benefits on the card include emergency travel assistance and free access to credit education tools. For those who are new to credit, this secured credit card is a gem. It charges no annual fee and the minimum deposit required on it is $200, and it can go up to $2,500. It shares monthly reports with all major bureaus and help you build a good credit history for yourself. Other facilities like identity theft support, purchase protection and free access to FICO score add to the benefits of this credit card. Citi charges a variable APR of 24.74% on purchases and balance transfers. The cash advance APR stays at 26.99 % at the moment and the maximum penalty APR can be 29.99 %. The late payment fee can be as high as $35. Deposits will be held for 18 months (minimum), without any interest earned. Although Citi does not offer you an automatic upgrade facility, it will return all your deposits after you make timely payments for 18 months- which is as good as having an unsecured card. At this time, you can also apply for a lower APR card or a higher limit. Since the card does not need any credit check, it can be great for those who have new defaults and cannot get approved for even secured credit cards, let alone the unsecured ones. You deposit $200 to $3,000 and you would get a credit limit same as your deposit. Though your credit activity is reported to all major credit bureaus, you cannot get upgraded to an unsecured card on this one. Once you have rebuilt your credit, you can apply for an unsecured card from a different issuer. The APR on this credit card is 19.39%, which is on the lower side when compared to the competition. The annual fee is fixed at $35. This card has levies a late payment fee of $27 and a returned payment fee of $25. 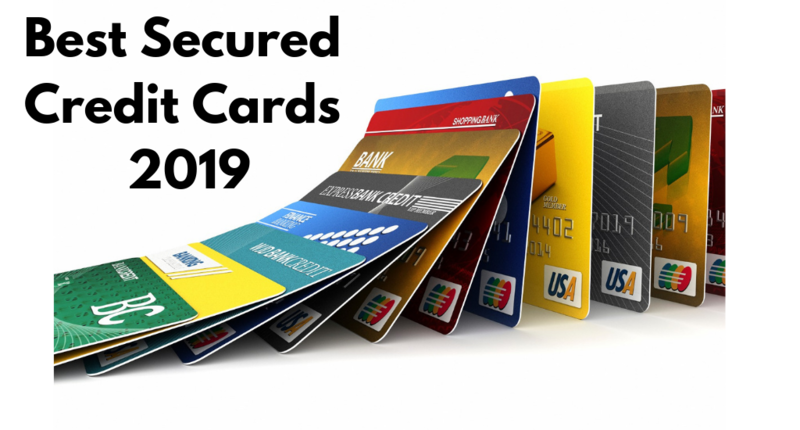 So, these are the top 5 secured credit cards for 2019. If you wish to apply for one, you should weigh the pros and cons as per your own credit needs and then make a choice. Make sure that the card you choose reports to all major bureaus so that you can build or rebuild credit. Give us your contact details via this blog form, we will help you out. How to Get a Credit Card for Every Credit Score? Lowest Interest Credit Card of 2019.